The invading humans were nimble, but not all moved fast enough to escape the deadly swipes from the mammoths’ mighty tusks. The mammoths were determined, and tireless in their defense of the herd. Soon their tusks were coated in red. Yet for every human that fell, more kept coming. And in the distance, another group of human warriors was forming a circle. These new arrivals were biding their time, spears in hand, waiting for a signal to attack. The mammoths fought on bravely, but deep down they knew their defensive line could not withstand a second assault. Then, seemingly out of nowhere, Ilara could see a tiny figure streaking toward them. The girl was smaller than any of the other humans on the field, yet her speed and agility made her stand out. The mammoth warriors ignored the little intruder, as they were busy fighting off the larger humans. They knew the mammoths in the inner circle could easily dispose of such an insignificant threat. Ilara watched, mesmerized, as the girl bobbed and weaved, apparently running to her doom. She ran between the legs of the mighty mammoth warriors, easily broaching the front lines. Once she was through, the mammoths on the inner lines turned to face this little human. Now that she was in their midst, it would take mere seconds for them to kill her. But the girl was now finally near enough for Ilara to see clearly, and suddenly she understood. “Wait!” she shouted, and the mammoths around the girl hesitated for just a moment. It was enough. With sure strides she covered the distance between her and the little human, until the two of them stood face to face. Suddenly they realized that the fighting around them had stopped. Both the humans and the mammoths were just standing there, staring at the two of them. What happened next was not comical at all. As if with one mind, the humans released their weapons. The spears flew high, tracing graceful arcs through the air. In that moment all was silence. But in the very next moment the spears hit their targets. Suddenly the battlefield was filled with the howls of rage and anguish erupting from the warrior mammoths. This first attack had clearly had its intended effect. The thick hide of each mammoth warrior was pierced through in many places, and each mammoth on the front line was clearly in intense pain. But the next moment, the mammoth warriors began methodically to pull the spears out of each others’ hides. The extraction of the barbed spears was painful, perhaps more painful than the initial attack, but the simple act of helping each other seemed to create a new sense of resolve in the mammoth army. As one, the mammoth warriors turned toward the humans and charged. And then all was chaos. There was a long pause. Ilara started to wonder whether the enemy had just given up. But when the humans finally came, they came in force. And they came from all directions at once. In a flash she understood. In response to the mammoth herd’s defensive strategy, the humans had modified their own strategy. Rather than attempting a frontal assault, they had taken the time to spread out, to form a vast circle. The human tribe could afford to do this, because they far outnumbered the mammoths. All they needed was find a single weak point in the mammoth herd’s defensive ring. That would be enough. The humans ran inward toward the herd, spears raised in the air. Their war cries, familiar and yet strange at the same time, filled the open plain. Ilara had a moment of dislocation. These humans were all impossibly small. To her mammoth eyes they looked less like mighty warriors than little monkeys carrying tiny pointed sticks. The sight was almost comical. Whatever was causing the commotion, she was hoping it wasn’t what she thought it was. But that hope died as soon as she heard the cry go up. It was just one word, but it was enough. “Humans!” There was a feeling of general panic. Yet that was quickly replaced by a sense of organization. The entire herd moved in unison to a large open plain, with the grownups prodding the little ones along. At first she was confused by this. Wouldn’t they want to seek shelter? But then, as the herd began to organize itself, she started to see the logic. The youngest within the moving herd were placed in the very center, then the young of about her age were organized in a ring around those, together with the very old. In the outermost ring, ready to face outwards in all directions, were the warriors, the fully grown males and females of prime fighting age. If they had tried to seek shelter, they might have been cornered by the humans. But this way, the herd had maximum strategic mobility. No matter which direction the humans could try to attack, they would come face to face with several fully grown woolly mammoths. And there are few things more fearsome in all the world than a woolly mammoth protecting her herd. “Well actually no.” She decided it wouldn’t work simply to lie, because he’d know. Maybe she could tell him just enough to talk herself out of this. There was something about the way he said “swarm” that Ilara found chilling. She pictured a huge horrible cloud of insects, all coming after her. Was that really the way they thought about her kind? She was about to answer, when suddenly there was a commotion. Mammoths were running about in every direction, and the look in their eyes told her that something in the mammoth village was definitely not ok. It didn’t feel like any school she had ever been to. The teacher seemed a little scary to her. She had never seen such an old mammoth. He moved slowly, but each movement seemed to contain a kind of coiled power. The teacher took his time looking over the class, staring each student in the eyes one by one, until his gaze came to rest on Ilara. “You seem different today,” he said. He said it simply, without particular emphasis, but still, she felt her heart drop through her stomach. She hoped in that moment that the earth would swallow her up. Unfortunately, the earth was not cooperating. It seemed like an innocent enough statement. After all, it wasn’t really a lie, even if it wasn’t the whole truth. But then she realized that everyone in the class had gone completely silent. All the other mammoths were now looking at her. Ilara was deep into conversation with the cute boy mammoth before she realized that she had no idea what to call him. She was enjoying the conversation — and learning a lot about mammoths — but she was essentially talking to a stranger. The boy mammoth was walking along beside her and chatting away as though it was the most natural thing in the world. He didn’t know, she realized, that they were strangers. In fact, he kept acting as though they had known each other all of their lives. And it was probably true that he had known another version of her. But that other version, she thought, was probably in her own village right now, impersonating a human. Impersonating her! She was so lost in contemplation that she didn’t realize where they were going until they were already there. Looking around, she was startled to realize that they were now surrounded by other young mammoths. Well, it wasn’t her name exactly. In fact, it didn’t really correspond to any sound she had ever heard. But she knew he was talking to her. Anyway, in her mind the name translated pretty much as “Ilara”. She decided that was ok.
She turned to look, and realized she was looking at a very attractive boy her own age. Well, ok, a mammoth, but her mind easily made the translation. And the way he was looking at her was unmistakeable. He was trying to be casual about it, but she could tell he liked her. And that was ok too. But what was she supposed to do now? She felt that any moment she would give herself away by doing some stupid human thing. “I heard you the first time,” she heard herself answering. “But maybe if there’s a problem, it isn’t with my ears, it’s with your trunk.” Without thinking about it, she gave her ears a little swish. The boy mammoth blushed. She knew he wasn’t literally blushing, but if a boy mammoth could blush, she was sure that’s what it would look like to another mammoth. 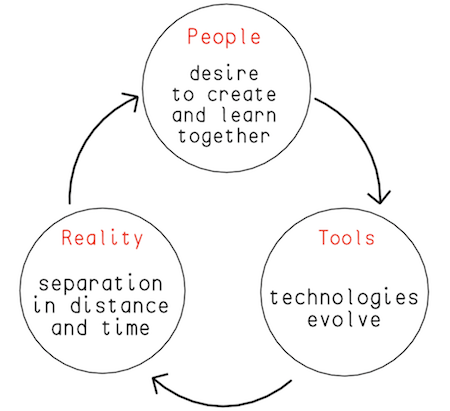 People want to collaborate, to create together, to learn from each other. And yet the reality of our human existence is that we are separate from each other, sometimes in distance, sometimes in time, often in both. So we develop tools to help us compensate for the reality of our mutual separation. Yet those tools, even as they give us greater power over reality, end up changing our reality. This is because they provide us with the capability to support even greater separation in distance and time. Cave drawings lead to the written word, which leads to printed books, then the telegraph, radio, television, the internet, smart phones, augmented reality, and whatever lies beyond that. Domestication of horses leads to the wheel, then the cart and chariot, eventually the train, the automobile, and whatever comes after that. Our eternal desire to bridge our separateness causes us to create ever greater capabilities for civilization to support wider and wider distances between us, both in time and in space. As she wandered among her fellow mammoths, Ilara was surprised at how familiar everything seemed. Not familiar in the usual way, just strangely normal. Ilara and her mammoth friend had agreed to take this opportunity to learn about how each other lived. It had seemed like a good idea at the time, but now she wasn’t so sure. For example, what would she do if somebody tried to talk to her? That might not end well. Fortunately, everyone in the herd was pretty much ignoring her. If any of the mammoths sensed anything out of the ordinary, they weren’t showing it. That, at least, was a relief. Suddenly, to her great surprise, she heard somebody call her name. You are currently browsing the Ken’s Blog blog archives for February, 2018.